Not only are we individually physical beings, living and acting in a physical world, but our contacts with one another are played out in that same physical world, whether in a formal handshake or in sexual intimacy. Even our spoken words, gestures and facial expressions require physical proximity if not contact. However, over the years, layers of technology have allowed us to establish contact while temporally or geographically remote: letters, the telegraph, paintings and photographs. Today opportunities for remote contact often seem to swamp face-to-face encounters, with the growth of Facebook, Instagram, WhatsApp and even plain old-fashioned video-conferencing. We will discuss virtual reality in a later chapter, but forms of video-conferencing belong here, as it is the image of the real human body that is projected across space, even though its transport is by pixel and wire. Face to face conversation is enabled not just by spoken words, but by continual gestures, and movements of the face and eyes. While video preserves these better than text-based media or avatar-based VR meetings, still the glass barrier of the screen not only separates us psychologically, but may also lose some of the subtle cues that help us to communicate. One problem is that when you look straight at the image of the person you are talking to, the camera is slightly to one side or above the screen, so that your conversant sees your eyes averted or looking down. An early solution, the video tunnel, used two-way mirrors to enable the camera to be effectively placed in the middle of the screen [SO91]. However, though useful for experiments it was an impractically large contraption. Current laptops and screens often have a built in CCD camera close to the top of the screen, which reduces the angle compared with older ‘bolt-on’ arrangements, though still not entirely. The situation is worse still for multi-person conversations as it may not even be clear to whom one is talking. One early solution, Hydra (see Box 6.1 ), tackled this by having a number of tiny screens each with its own camera, so effectively each screen on the desk ‘stood’ for one of the participants. While video conferencing tools such as FaceTime and Skype have their strengths, their social dynamics are different from those enabled by physical presence. In the early 1990s Bill Buxton attempted to tackle this issue of video presence [SB92]. While it may not have succeeded, there is much to recommend his concept, which combined the advantages of physicality with those of video-conferencing. Hydra consisted of a number of physical screened devices, each showing a video image of a single participant. The device also housed a microphone, speaker and camera and so, in effect became a physical–digital avatar of the person: the camera represented that person’s eye, the microphone their ears, and so on. More recent systems, including HP HALO (now incorporated in Polycom Immersive Telepresence), are more sophisticated, with identical rooms at different locations designed so that the video of the remote room seems to fit seamlessly into your own meeting room — but of course at the cost of a dedicated and expensive installation. It is easy to think that everything virtual and internet is new and never seen before. The point at which technology finds its way into mainstream media is often telling’. The film ‘You’ve Got Mail’ [Wa98] did that for online romance, but virtual love affairs are now common, with internet dating sites and meetings in chat rooms, and there have even been weddings in cyberspace dating back to MUDs in the 1990s [Cu92;Ir96]. However, romance by letter dates back hundreds of years and it was 1848, not 1998, that saw the first tele-wedding [St98]. The daughter of a wealthy Boston businessman fell in love with one of his employees. To prevent the affair from developing the father posted the unwelcome suitor to the European office and he duly went. However, the daughter was not to be foiled in love so easily. While her beau was still en route, his ship called in at New York, where she sent him a message telling him to bring a magistrate to a telegraph office. With each at opposite ends of the telegraph line, they were married. Her father contested the marriage, but the courts upheld it. Love conquers all. Whether or not they were forged online, many couples and families are forced to have long-distance relationships due to their jobs. Email, instant messenger and webcams have now joined or supplanted the traditional love letter, but are not a substitute for physical closeness. A number of more tangible ways of establishing physical contact have been exploited, some in artistic settings, some as research probes [LM09]. One early example consisted of two rollers linked to one another by the internet [BI98]. If the user at one end spun her roller, the roller at the other end would also spin, and if her remote partner spun his she would see hers move. If they both touched the roller at the same time they could feel the pressure of the other, either working with them or against them, like holding hands beneath the tablecloth. Others have experimented with clothes, for example using electrically reactive materials to create a hugging shirt that lets you send ‘hugs’ to your partner via a mobile phone [CC09]. Of course, Kevin Warwick’s direct nerve implants attempt to establish a form of intimacy that, as far as possible, bypasses physical means entirely (see [Wa03]). Yet as well as bringing remote people together, technology often gets in the way of direct human contact. Central heating replaces being together round a winter fire, and even family TV watching has been replaced by per-person devices and apps: mobile phones, iPads, YouTube. Ethnographies of work settings repeatedly find that both the physical things and the arrangement of people in an environment are crucial to enabling coordination and collaboration. One classic example is a study of a London Underground Control room [HL92]. The room contains a large display, the ‘fixed line diagram’, which is visible to everyone and shows the locations of trains, track and signals. Not only does this give explicit information, but its common availability is essential to the staff’s understanding of each others’ behaviour. As well as the fixed line diagram, which is updated by the actual movement of trains, the cellophane pages of a printed timetable are edited in felt pen by the Controller, a publicly visible act and one emphasised by talking out loud. In fact ‘overhearings’ of one sort or another are critical for numerous activities in the control room, and are enabled by each member of staff being distant enough to be able to get on with their own job, but close enough to be able to monitor other people’s actions and words. Studies of other ‘command and control’ situations, such as the bridge of a ship, airport ground services and air traffic control, reveal different details, but similar importance of the mediating artefacts. Air traffic control has been particularly well studied in several countries because it is necessary to automate more due to increasing volume, and yet difficult to do so in a way that does not compromise established practices and so threaten safety [HO95]. Until very recently, a critical part of the traditional air traffic control system was the ‘flight strip’, a small slip of paper printed out when a plane entered the airspace. These carried information such as the flight number and altitude of the plane. The air traffic controllers sat in pairs, each with their own screen, and the flight strips were placed in a rack between them. As well as updating the flight strips when, for example, the altitude changed, they would also slightly pull out strips that were of particular interest for any reason. This was partly to act as a reminder for the controller working with the plane, but also implicitly allowed the other controller to monitor the general situation, since lots of tweaked strips might indicate problems. It is not just in work life that we use the physical world to coordinate with others. In the home we have message boards, and notes stuck to the refrigerator door; we notice that a coat is in the hall or keys on the table and know that a family member is home. Many of these signs are implicit and we would be hard-pressed to articulate all the ways in which we use them, but they are crucial in giving us a sense of ‘what is going on’. With the coat in the hall it is the presence of the object that is the ‘message’, unlike, say, the London Underground timetable, where the message was written explicitly on the object. We will discuss the different forms of these ‘accidental’ properties of objects in more detail in Chapter 14, but in this chapter we are interested in the way the presence, movement and exchange of objects facilitates social interaction. During a meeting one person may pass a report across the room. The report was there all along, but the act of passing it says ‘this is now for you to read’. When sitting near someone, even changing the orientation of a paper may say, ‘you read this too, but I’m still holding on to it’. When working remotely with digital media, we may be able to see someone on a webcam, hear them and be able to send documents, but it is hard to replicate the subtle interactions around shared paper. For people working together, shared screens can be one means of establishing that rapport while using digital technology. 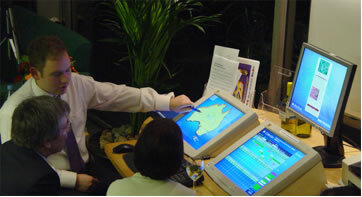 One example involved using a large horizontal screen or multiple smaller screens for planning Australian travel itineraries with a travel agent [RR03;RS07]. The shared point of reference and side-by-side orientation allowed many of the same subtle bodily interactions as a paper-based meeting, while still making use of the power of the digital planning software, including interactive maps, hotel and tourist information. 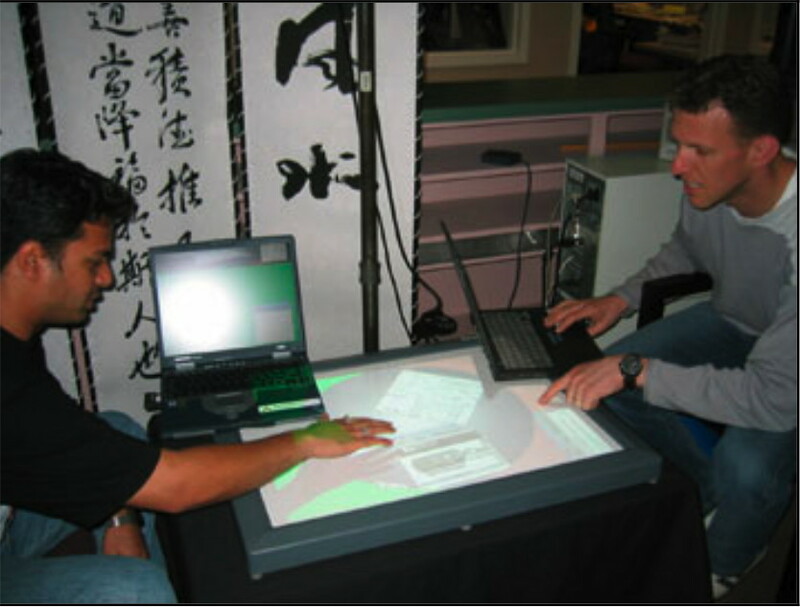 Interactive tabletops, such as the Microsoft Surface, allow more subtle interactions, as the digital documents can be shuffled around not unlike real papers. One system, UbiTable, uses a tabletop display that can link to users’ own laptops [SE03]. Although only a prototype the idea is that it could be used in public places like airports, where people may have an ad hoc meeting and want to share some information, yet keep other information private. With paper, you might have papers in your briefcase, papers on your side of the table, or papers moved so the other person can see them. UbiTable emulates this by connecting to your own laptop (private) and allowing documents to be moved to the shared tabletop display. Once on the display they can be on your side of the table facing you (personal) or moved into the centre of the table and rotated around so the other person can easily see them (public). Some organisations clearly have a physical purpose: a factory making cars, a bus company carrying passengers, or a theatre presenting a play. Others, while having physical premises, have less physical outputs: a bank, an insurance company, or a travel agent (as opposed to an airline or hotel). However, even those with physical outputs also have ancillary functions more like the bank or insurance company: processing orders, paying staff, managing stock. An organisation has many roles, but one of them is some form of information processing, either, like the travel agent, as its principal role, or, like the car factory, as a secondary one. In computing the Church–Turing Thesis asserts that in the end all computers can do the same things, given sufficient memory and time. Strictly this refers to what can be achieved or what is computable; in principle computers could be very different in the way in which they perform computation. However, in practice most computers are very similar in terms of the major components and structure. If you have a new computer you can ask questions like ‘where is its memory?’ and usually get a sensible answer. In fact commonalities are also found between the human brain and computers, and this computer–brain analogy lies at the heart of much of cognitive science. There are limitations to such a view, indeed our brains perform a substantial amount of associative thinking, linking ideas together by similarities, whereas digital computers tend to be largely sequential. However, it has proved a very useful analogy for both disciplines. Given this, and the fact that organisations perform information processing functions, it seems reasonable to look for structural similarities between the organisation and the computer, a form of socio-organisational Church–Turing hypothesis [DW98]. In fact, distributed cognition (see section 5) uses precisely this sort of computational language when discussing individual and small group activity in their environments [HH00]. The most obvious two elements in a computer are the program and the data. Computer programs are always explicit (the code) and expressed formally. Similarly the organisation will have some formally written processes and rules of operation. These rules are not, however, followed in a lock-step fashion across the organisation, but by each department and each individual doing their job and together achieving the overall organisation’s objectives (one hopes!). That is, in terms of the computational analogy, it is a distributed system. However, not all the rules are formally written down. The clerk just knows that when she gets a blue form ZK9b it needs to be signed and passed on to the Accounts Department. Data is usually easier to locate than process: some is stored physically in filing cabinets and ring binders, some digitally in databases. This aspect of the organisation has been most consistently subjected to computerisation, although the process side is also automated in some workflow systems. Even here some of the data is in people’s heads, particularly more personal sales knowledge about customers and clients. While such implicit data and process knowledge may work well, for the organisation it can become a problem when an employee leaves or is sick. The desire to record, preserve and pass on this knowledge has been a major impetus in several areas of management science, such as organisational learning and customer relation management. However, what about the more ephemeral aspects? A computer has a ‘program counter’ that says where in a program it is operating. So how does an organisation ‘know’ and remember what it is doing? Imagine it is night, everyone has gone home and the office lights are turned off. The records of the organisation are preserved in filing cabinets and databases, the processes in rule books and, intangibly, in people’s job knowledge. But in the morning how does the organisation ‘pick up’ where it left off the night before? Somewhere, there must be placeholders that say what is to happen next. Just as with the processes and the data, some of this may be explicitly written down, perhaps ticks on a timetable of activities or ‘to do’ lists left on people’s desks. Some will be in people’s heads: they remember where they left off the day before. However, typically much is stored in the physical locations of documents, records and forms. You know you were partway through filling out form ZK9b yesterday because this morning it is sitting there on your desk half complete, and the organisation ‘knows’ that that form is at a particular point in its processing because it is on your desk and not somewhere else. When we think of culture, particularly past culture, it is likely to be in terms of physical artefacts and buildings: the Mona Lisa, Stonehenge, the Pyramids and Acropolis, McDonald’s burgers and Marvel comics. For oral cultures studied by archaeologists there are indeed only the material traces. 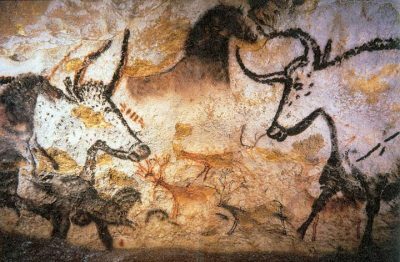 The society that created the cave paintings of Lascaux may have had a sophisticated oral culture with folk tales and song for which the familiar running horses and aurochs were just a backdrop. But if so the words and music died with them. All we have is the paint on the walls. Our view of our technological past is likewise informed by, and often relies solely on, preserved or discarded artefacts, from Neolithic axe heads to Victorian shovels. Even in relatively recent times when the records of the great and the letters of the middle classes preserved their legacy, the lives of mundane craftsfolk are poorly documented; we only know them through what they made. In a literate age, print and music stave have preserved words and music although even now the knowledge of things can easily be lost (see box). 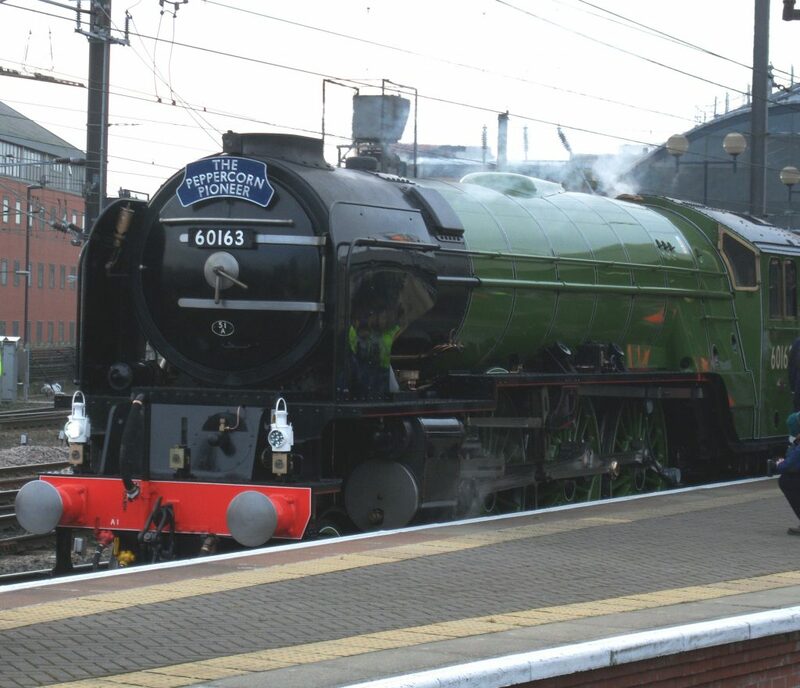 The Tornado, a reproduction Peppercorn class ‘A1’ steam locomotive, was completed in 2008 after 18 years in construction. The original engines had been built in 1949, but scrapped 15 years later as diesel locomotives took over. The last surviving plans for the Peppercorn were only just saved when they were rescued from a skip, their discovery leading to the establishment of the A1 Steam Locomotive Trust (http://www.a1steam.com/), which reconstructed and now runs the Tornado. The things we have around us, from the TV set to the electric kettle, shape our understanding of who we are, and how we see the world. However, the Soviet philosopher Ilyenkov went further. He saw ‘ideals’ (ideas or concepts) as being both embodied in artefacts and also giving those artefacts meaning [Il77]. So a chair is a chair and not simply pieces of wood because the ideal of the chair has been made material through the labour of a carpenter, and has become a chair. However, equally it is our idea of the chair that enables us to make sense of those pieces of wood arranged in that way and see that they are for sitting on. The physical world is central to politics. The land itself is at the core of the notion of the nation state: whether protected by walls and border controls, or simply measured out on a map. However, when we consider national identity it is often the symbolic nature of physical things that becomes important: the Houses of Parliament, Capitol Hill or the Kremlin, waving flags and national costume. Digital technology has challenged the physical form of the nation state, making borders permeable. In the demise of the Soviet Union, the Allied bombing of Baghdad, the 2016 US Presidential Election, and numerous G8 summits, the openness of the Internet challenges the power of arms and police. Yet perhaps the most radical subversive power of the digital is that it destabilises the control of information. As Orwell’s 1984 highlights, what we have most to fear is not the physical power of states, but the more insidious psychological repression [Or49]. Again and again totalitarian states have diminished physical distinctiveness to de-individuate and de-personalize and have used control of the press to control people’s minds. In 1984 even the dictionary was rewritten so that only the ‘right’ information could exist. Blogs make the faceless human, and tweets undermine propaganda, although conversely these can also be the source of ‘fake news’ or state-sponsored manipulation. However, the digital world also provides the very tools of state that Orwell imagined. In the UK there is one CCTV camera for every 15 people and while steaming open letters was laborious and hard to hide, the digital scanning of a nation’s email is silent and swift [Wo06]. In other ways, globalisation is reducing the integrity of the nation state, which was historically rooted in space and geography. Groups have always claimed allegiances before and beyond the nation state. Some groups are regional, for example Italy is a young nation so many Italians feel as stronger regional than national identity, even down to the town (a sort of local nationalism called ‘campanile’ or ‘campanilismo’ [Ca12]). Beyond the nation, multinationals, campaign groups, NGOs and social networks all claim loyalty; if Facebook were a country it would be the most populous in the world. Other allegiances are non-geographic, based around religion, trade, sport or fandom. In nature, computation and human society there are two ways in which something can obtain integrity and identity. One way is through boundaries: cell membranes, city walls, or barbed wire fences. The other is through shared attributes: ant pheromones, bird song, or tagged photos in Instagram. Where groups have no geographical boundary to define them, they often resort to physical symbols to identify themselves: coats of arms on the medieval battlefield, hoodies in the shopping mall, or brightly striped scarves in the football stadium. In the digital world there are no boundaries and no physicality, but blogs and social media pages are skinned and decorated, and it is possible to buy badges and T-shirts based on your favourite computer games (fig. 6.8).